What does the smartphone navigation bar and course player look like? The smartphone course player is designed for optimal mobile delivery. The look of the player will vary slightly from one course to the next depending on the theme design of the course. 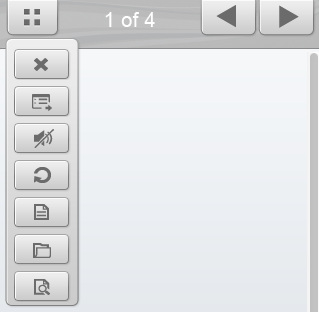 The top Nav Bar contains a dropdown menu button and Back and Next buttons. If you enabled swipe navigation (publish setting), then your learners can use touch gestures to swipe from one page to the next on devices that support touch gestures. You can tap the Nav Bar Menu to display the drop down containing buttons to Exit, open the Menu, view the Transcript, turn Audio on or off, Replay or refresh the page, view References, view Resources, and view Glossary. Available options depend on the features in a course or the custom buttons added to a theme. A scroll bar appears on the right side of the player if there is content that extends beyond 480 pixels. The width of the player content area is 320 pixels. What are the differences between viewing a course in Claro on a tablet and on a desktop browser? Why does my embedded web object (From URL) not work correctly on iOS devices (iPad, iPhone)? My inserted webpage overflows off the screen. Why does text not show up on my iPhone (iOS v.4.3.5) device when a movie is present on the page? Why doesn't my onMouseOver event action work when I look at my course on a mobile? Use onClick events for mobile interactions. How do I make my courses available to dominKnow Mobile app users?